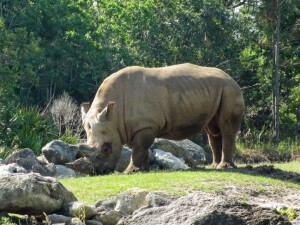 The white rhino ranks as the third largest land animal, behind the Asian and African elephants. Both male and female rhinos have two horns that are solid keratin, not bone. Keratin is a protein compound also found in hooves and hairs. Horns are used in defense, along with rapid charging of approximately 28 miles per hour. Their eyesight is poor. The eyes are very small and located on opposite sides of the head, so in order to look forward the rhino must turn its head. They depend heavily on their sense of smell. In fact, the olfactory passages responsible for their sense of smell are larger than their brain. They often take mudbaths that help regulate their body temperature and maintain the condition of their skin.